Remote Application Server - Activate a trial version. First run the Parallels Remote Application Server Console and log in using your domain credentials. 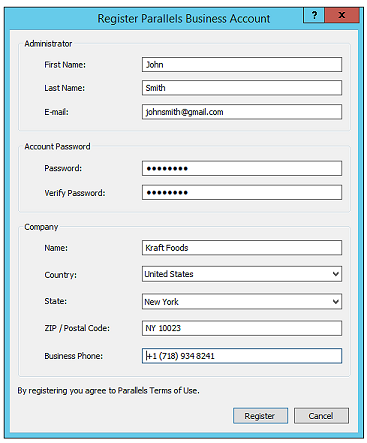 If you already have a registered Parallels Business Account, enter your Username and Password. Click on Sign in and skip to Step 3. Alternatively, if you haven’t registered for a Parallels Business Account, click on the Register… button and continue to Step 2. When the dialogue box above appears, insert your details and click on the Register button to create your account. If all the details are entered correctly, a prompt stating your account has been successfully registered will be shown. 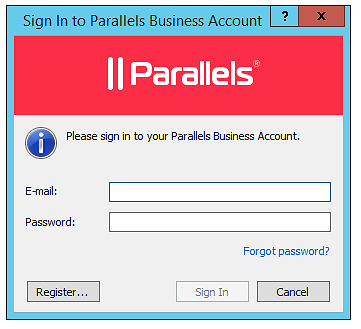 You will then be taken back to enter your Parallels Business Account credentials as described in Step 1. Once you’ve logged in, the dialogue box above will appear. Select Activate trial version and click on the Activate. If the trial version is successfully activated, a prompt will appear stating that you have successfully activated Parallels Remote Application Server.